Founded by the Daughters of Charity in 1862, Saint Agnes Hospital is a full-service teaching hospital in Baltimore, Maryland with residency programs in medicine and surgery. As part of a recent expansion program, Saint Agnes renovated its chapel in 2013. The newly renovated chapel retains historic features like a circular stained glass window but includes new marble floors and freshly painted walls. The hospital knew that the chapel would need a new audio system. 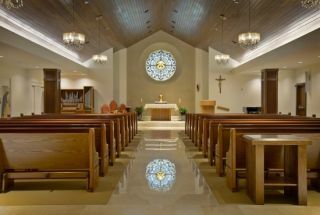 The existing audio system had uneven coverage and poor sound quality and the existing pendant loudspeakers didn’t match the chapel’s new appearance. Schwartz designed a new audio system for the chapel using a single ENTASYS 212 on one side. His calculations showed that a single ENTASYS could cover the entire chapel well and he wanted to avoid a challenging wiring path to the other side. He completed the system with a new DSP and power amplifier, a pair of wireless microphones and a gooseneck mic for the lectern.